We are sold out of advance tickets for this show. Standing room only tickets will be available when the music starts at 8pm. Vienna Teng and actors from The Fourth Messenger will play songs from the newly released cast recording. After an extended intermission and time to mingle in the lobby, Vienna will play a solo set of requests and favorites. Vienna Teng sings beautifully, plays the piano impeccably, and performs her own original songs with a style and grace that just may leave you breathless. She also flat out entertains – engaging her audience and turning her performance into an intimate conversation. 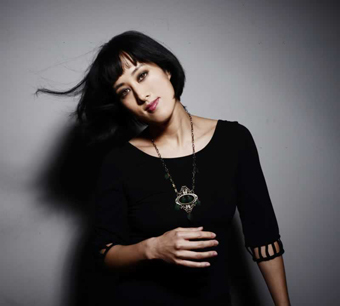 Yes, she does most of the talking and most of the singing, but she’s also listening – there’s a back and forth element to a Vienna Teng performance that makes the audience feel involved and connected. Oh, she plays an occasional cover that often improves on the original, and she uses technology effectively, recording snippets of her own playing and singing as she goes along to provide backup harmony and percussion – but the main thing is the beautiful voice, the accomplished playing, and the enchanting songs. Vienna grew up on the peninsula, majored in Computer Science at Stanford, worked as a software engineer at Cisco Systems, and somehow managed to study classical piano and begin performing at clubs. Along with earning dual graduate degrees at the University of Michigan, one from the School of Business and one from the School of Natural Resources and the Environment, she has found time to perform on Late Night with David Letterman and NPR’s Weekend Edition, co-write a musical, open concerts for Joan Baez, Shawn Colvin, and India.Arie, and release seven albums, including her latest, Aims, which won four Independent Music Awards, including Best Adult Contemporary Album, and Best A Cappella Song, Best Pop Song, and Best Social Action Song. She has attracted an adoring audience, and her shows at the Freight tend to sell out, so if you want to see her – and you should! – get your tickets early.